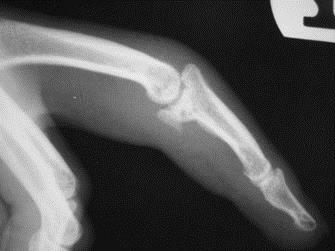 To Cite: Najd Mazhar F. Proximal interphalangeal joint fracture dislocation, Shafa Ortho J. 2014 ; 1(2):e73. 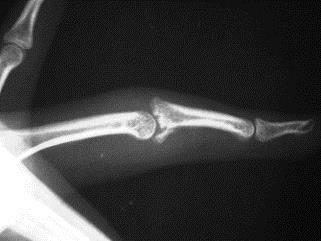 Abstract: Volar base fracture of the second phalanx in the proximal interphalangeal joint fracture dislocation is a challenging injury with high rate of permanent disabilities. Different methods of treatment like extension block splining, open reduction and internal fixation, volar plate arthroplasty and recently hemi-hamate arthroplasty address this complex injury. Stable fracture dislocations with less than 30% of articular surface generally can be treated conservatively with dorsal block splinting for 3 weeks in 30 degrees of flexion (a,b). a,b). 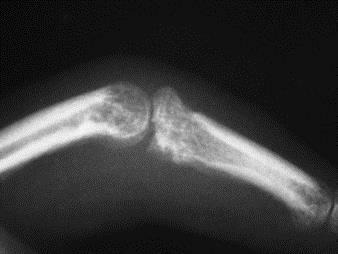 Joint stability and congruency should be checked properly with appropriate imaging modalities in active arc of motion. Range of motion exercises should be advised to reach to 10 degrees joint extension weekly. Satisfactory results have been reported by this technique (3, 4). When P2 volar base fracture dislocation accompanies with a single and large fragment, ORIF can result in stable and congruent joint (5). Restoration of joint anatomy is technically demanding even in the presence of a large fragment which is suitable for internal fixation. There are reports on complications after open reduction including pain, stiffness, flexion contracture and cold intolerance (6). Articular surface impaction is common finding and can compromise the results of treatment by open reduction and internal fixation (6). Approach to the fracture can be performed through dorsal, lateral or volar directions (6, 7). Anatomic reduction of the articular surface can be maintained by one or two mini screws (Figure 2a,b). 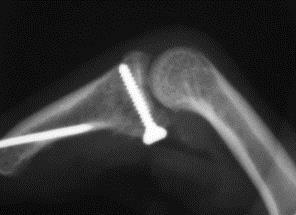 For decades, volar plate arthroplasty (VPA) was the preferred technique for P2 volar base fracture which could not be addressed by extension block splintage or ORIF because of the markedly comminuted and impacted fractures. In this technique the injured PIP joint is approached from volar direction through Brunner or equivalent incision. The pulley system excised between A2 and A4 pulleys or elevated by making a radial or ulnar base flap. 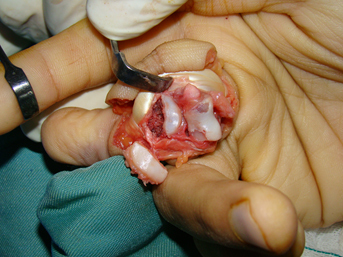 Flexor tendons then retracted one side to expose the volar plate. The volar plate remained attached to the proximal phalanx and PIP joint hyper extended by incision of accessory collateral ligaments to gain full access to the articular surface. By excision of comminuted fragments from the defect in volar base of P2 a suitable groove will be made at this area perpendicular to the long axis of P2 to accept the volar fibrocartilaginous plate. The plate will be anchored or pulled out to the most proximal of the bed in 30 degrees of PIP joint flexion after advancement. Lateral radiographs are essential to evaluate the congruent reduction and detect any subtle subluxation (Figure 3a,b). We have various reports on this challenging technique results. Good results of its efficacy have been reported in literature (8). For instance, Dionysian and Eaton reported their long term experiences with VPA. They reported a long term follow up of 17 patients for an average of 11.5 years (9). Accordingly, there was no complaining of pain at rest or during activity although some degree of joint narrowing at the final follow-up was reported in 4 patients. Patients having VPA within 4 weeks of injury had reached better active range of motion than those whose injuries had been addressed in more than 4 weeks (85 v/s 61 degrees) (9). These researchers concluded that VPA can offer satisfactory function and painfree motion in long term (9). 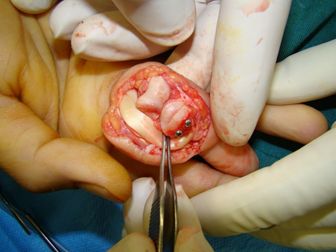 Hemi- hamate arthroplasty (HHA) was introduced to the world of the hand surgery by Hastings and his colleagues in 1999 as a scientific presentation at 54th annual meeting of the American Society for Surgery of the Hand in Boston. HHA is used as an alternative for VPA and to address the failed surgeries of P2 volar base fractures. HHA is a resurfacing arthroplasty with using the autograft which is harvested from the dorsal distal aspect of the hamate carpal bone from ipsilateral wrist. 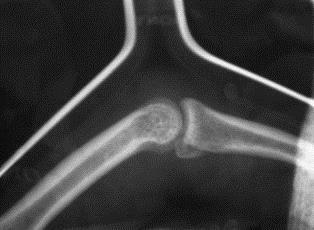 The fracture is approach by volar direction using the skin flaps elevation. 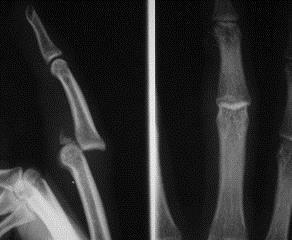 The base of flaps in two radial side digits is radial whereas it is ulnar side in ring and small fingers. The flexor sheath is elevated as a flap between A2 and A4 pulley and flexor tendons are subluxed to either radial or volar sides. Volar plate preserved proximally attached to its origin and after detaching the collateral ligaments from their origins on the proximal phalangeal head, the PIP joint is addressed by hyper extension and “Shotgun approach” (Figure 4a). Using mini oscillating saw a box like bed is prepared at the volar base of the P2 to accept the harvested hemi-hamate autograft. (Figure 4b) The harvested autograft transferred after 180 degrees rotation in two planes into the prepared bed at the volar base of the P2, and stabilized with two or three mini-fragment lag screws (Figure 4c,d,e). The stability of PIP joint can be restored by rebuilding the cup shaped geometry of the P2 base and palmar plate attachment. Using this technique Williams and colleagues (10) reported the results of 13 patients at a mean of 16 months follow up after HHA. According to their results, HHA has lesser risk of resubluxation than VPA. Calfee et al (11) reported long term results of HHA in 33 patients. They evaluated 22 patients for mean of 4.5 years (range, 1–7 years). 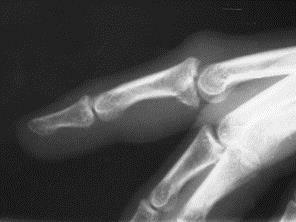 By assessing functional outcomes, joint alignment/motion/stability, grip strength, disabilities of the arm, shoulder, and hand (DASH) scores, and visual analog scales (VAS) of pain and function, they concluded that HHA represents a valuable surgical procedure to address severe PIP joint fracture– dislocations (11).